In a move anticipated through months of review and one that will give Scappoose and St. Helens fans a lot to talk about, the Oregon School Activities Association Executive Board and Delegate Assembly announced approval of its new six-classification plan for all sports from fall 2018 through spring 2022 Tuesday. Scappoose High School, with an adjusted 2016-17 average daily membership (enrollment) of 730 students -- above the updated Class 4A threshold -- will join La Salle Prep, Hillsboro, Milwaukie, Parkrose, Putnam, St. Helens and Wilsonville as Sandy jumps up to the Class 6A Mt. Hood Conference. The Cowapa League will remain Astoria, Banks, Seaside, Tillamook and Valley Catholic. "We're going to miss all the people we've worked with in the Cowapa League, but we're excited to see what Class 5A has to offer," Indians athletic director Robert Medley said. The Tribe has won eight Class 4A team state championships (boys' golf in 2017, baseball in 2015 and 2010, boys' basketball in 2015, girls' soccer in 2015 and 2013, girls' cross country in 2011 and wrestling in 2010) since it came up from Class 3A in 2007, and will welcome its new challengers. Scappoose also collected 17 individual titles (Linnaea Kavulich's girls' 3,000-meter run (2017); Mychal Hortert, Matt Shoun, Nick Rust and Justice Oman's boys' 1,600 relay (2014); Charlie Davidson's girls' 1,500 run (2014); Isaiah Goodrich at 182 pounds in wrestling (2014); Hortert, Shoun, Oman and Stephen Bowe's boys' 1,600 relay (2012); Adonis Siscoe's boys' 100 and 200 dashes (2011); Jadyn Harris, Bowe, Jason Amick and Siscoe's boys' 400 relay (2011); Charlie Davidson's girls' 1,500 run (2011); Travis Hill at 171 pounds (2011); Aaron Aguilera at 171 pounds (2010); Gabe Goodrich at 119 pounds (2010); Kevin Carpenter's boys' 200 dash (2008); Seth Honl at 130 pounds (2008); Ryland Geiger at 189 pounds (2008 and 2007) and Seth Honl at 125 pounds (2007)). The Lions, in the meantime, have celebrated a pair of Class 5A championships (volleyball in 2014 and boys' track and field in 2007) and seven individual crowns (Jacob Opdahl's javelin (2017); Dakotah Camberg's high jump (2017); Miguel Olmedo at heavyweight (2017); Myles Terry at 182 pounds (2015); Ryan Byrd's boys' 1,500 run (2012); Carson Bartlett's long jump and triple jump (2007)) since moving up from Class 4A in 2006. "The changes in the 5A league compositions in the next cycle of the OSAA classification and districting, I think, ultimately benefits the schools involved," first-year St. Helens athletic director Aaron Longo said. "Sandy High School will get to return to the Mt. Hood Conference and their traditional matchups. 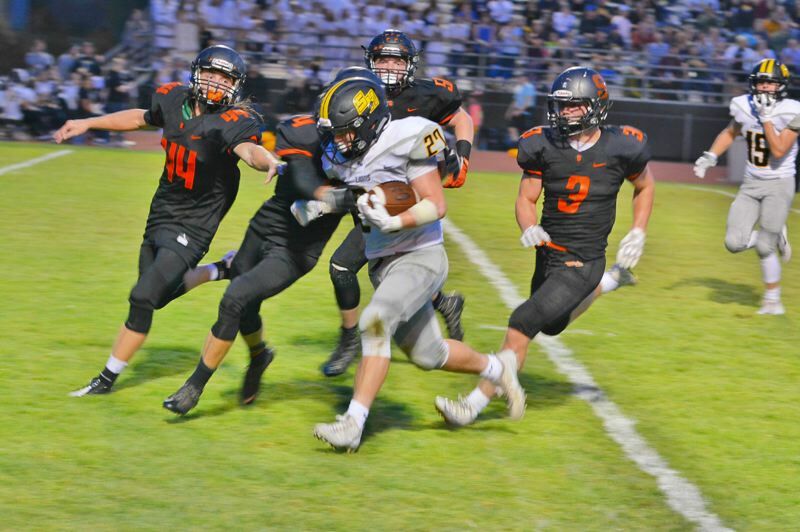 Scappoose will get to move into the Northwest Oregon Conference and see their historical contests and rivalries return as well. I think that the moves that are being made at 5A are ultimately beneficial to schools involved in all capacities." The Tribe and Lions will reunite after going head-to-head in Class 3A through 1999.